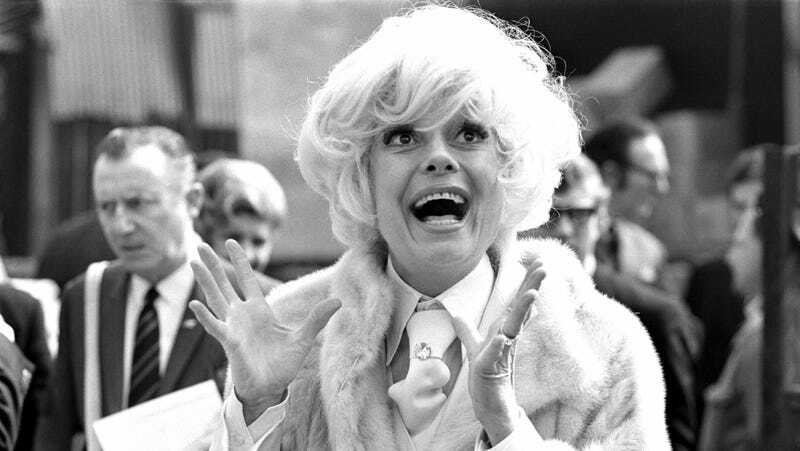 Carol Channing arrives in London for a four-week season at London’s Drury Lane Theatre on April 30, 1970. “No white woman can do it like I did,” Carol Channing told CNN host Larry King in 2003. The beloved singer and actress enjoyed more than 70 years of success on stage and screen before dying of natural causes on Tuesday morning in her home in Rancho Mirage, Calif. Channing was 97 years old. The Seattle, Washington-born Channing, best known for originating the titular role in Hello, Dolly on Broadway, as well as Lorelei Lee in Gentleman Prefer Blondes, amassed 28 theatrical credits and 29 film and television credits in her storied career. She earned four Tony awards (including two Lifetime Achievement awards) and seven nominations, an Olivier Award nomination for her role in Hello Dolly, a Drama Critics Circle Lifetime Achievement Award, and an Oscar nomination for Best Supporting Actress in the film version Thoroughly Modern Millie, for which she won the 1968 Golden Globe. Channing was also an early and outspoken advocate for arts education and for the LGBTQ+ community, which she often credited with supporting her success. Channing’s 2002 Lifetime Achievement Award Tony was granted for work with the Benefit for AIDS and The Actors’ Fund, which provides critical medical and financial assistance to many in the theatrical community. In 2003, Channing published her bestselling autobiography, Just Lucky, I Guess: A Memoir of Sorts. In it, the then 83-year-old revealed learning at age 16 that her paternal grandmother was African American, and her father of German and black ancestry (listed as “colored” on his birth certificate). In an interview with the Chicago Tribune, Channing recalled that her mother told her as she was leaving to attend Bennington College, lest she be surprised to someday give birth to a black child. In a transcript of her conversation with CNN’s King, Channing gave a further glimpse into the phenomenon known as racially “passing” in America, and revealed herself to be progressive beyond her era. KING: So you’re proud of your mixed heritage? KING: Some people years ago discovering that might have been disturbed by it? CHANNING: Yes, years ago because when I found out about it, you don’t want to do that. KING: You don’t say it. CHANNING: You don’t say it. There’s a lot of it down South. KING: People are ashamed of it. CHANNING: [I’m] proud of it. KING: I’m glad to hear it. CHANNING: I really am. I mean look, what makes you, you? You don’t know. None of us knows our heritage. Not in the United States. CHANNING: Exactly, this is the changing face of America. I’m part of it. Isn’t it wonderful?